Video games are weird in ways that still impress me. On the tasty end of that mad spectrum is Ultra Space Battle Brawl. Part tennis, part battle, and part halfway house, Ultra Space Battle Brawl is a hodge-podge of strange characters engaged in a space bash. At its core, however, is a highly bedazzled game of Pong. Simplistic as it is, this game features fast paced and addictive action tailor-made for on-the-couch multiplayer. 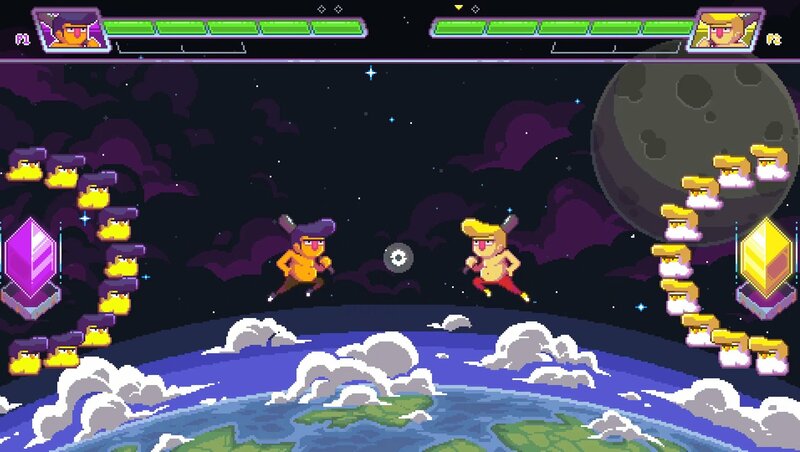 Ultra Space Battle Brawl is a 2D competitive ping pong game. Highly stylized with 16-bit visuals, the game mixes the modern with the ancient. The brawlers use various personal objects as makeshift rackets, bashing a projectile back and forth. The projectile changes colors based on who hit it last, and it can only affect one side at a time, meaning you have to strike aggressively and can’t rely on ricochets to help. There is an emphasis on speed, and smart spacing can help you to save a crucial moment or rapidly take control of the battle. Each side has a crystal that represents the fighter’s life, surrounded by a team of fat little baby chicks who share a hairstyle with their human counterpart. If you hadn’t guessed, the battles take place in space, where both the human fighters and their baby chick protection squads navigate the vacuum at will without need for protection. The chicks have to be cleared out to get to the life crystal they protect, which leads to a slaughter of these poor and amazing creatures in the name of interstellar bloodsport. That is the kind of wild imaginary intensity that you may hear out of your town’s local homeless street preacher. I’m impressed with the creativity throughout. The colorful graphics flash with slot machine intensity, with fast moving action topping backgrounds of deep space and lightspeed flashes. The characters aren’t astronauts or space athletes but rather a pack of weirdos, freaks, and losers. In the best way, Ultra Space Battle Brawl feels like a handful of gaming elements pulled from a hat. One of the best features is the high variance of layouts for each battle. There is the standard version where the entire left and right side of the screen is a strike zone, but others use different shapes, split the strike zone in two, or a combination of those. This makes each battle a different challenge and improves the gauntlet style of gameplay Ultra Space Battle Brawl employs. The game plays fairly smoothly but can be hard to follow. There is so much happening at once that at times, you have to readjust to get your bearings back. Because you can move across the entire screen, it can also be far too easy to get in close and win quickly. The game has a bad layout for playing with a keyboard as well. The game plays fine but looks better than it plays ultimately. There is a multiplayer mode as well as the standard story mode, where you go through a gauntlet of battles. Not a lot of variance is to be found here. This is the kind of game that you’ll play in bursts, or when you have friends around. While there is certainly a place for that style of game, Ultra Space Battle Brawl is so simplistic that it has a more intense uptake but less replay value on the other end. So overall, Ultra Space Battle Brawl hits hard and quick. There is so much intense visual splendor right from the beginning, and a heavy dose of nostalgia that draws you in even more. At first, the game provides a sense of surprise and gives you a seemingly new style of game to develop skills for. After a few battles, the reality of the glossed simplicity sets in. The game retains the fun, but the excitement wears away far too quickly.